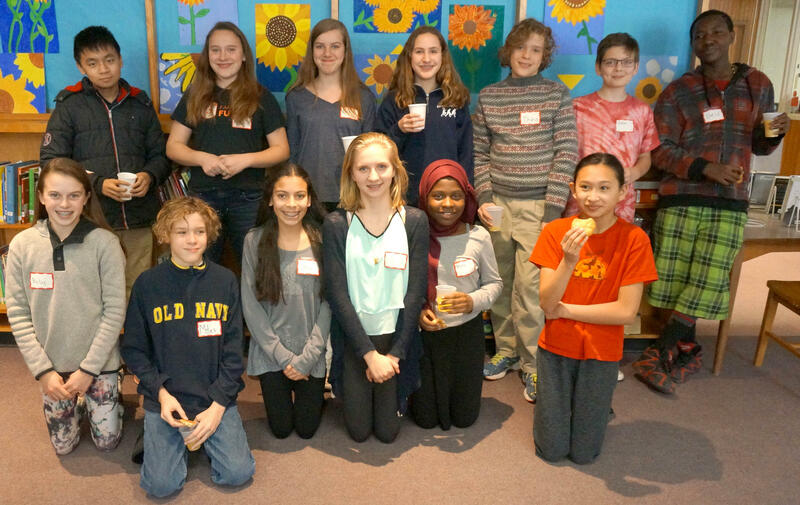 Students from Burlington's two middle schools played a matching game based on 'The Art of Secrets' to get to know each other before their book discussion. There are a lot of characters in The Art of Secrets. And we hear from each of them throughout the novel. We hear the narrators’ voices through emails, journal entries, text messages, investigative reports, and snippets of conversation. The unique format draws different reactions from these Burlington middle schoolers. Some students find it hard to follow the mystery, but others like that it keeps them guessing. "It was quite interesting but also confusing ... like guess and work out though what information you have," said Edmunds seventh grader Emily Widyawati. Edmunds eighth grader Khalid Barwani commented, "At the ending I was really confused. It confused me. I had to re-read it again and again until I found out." Hunt sixth grader Theo Ellis Novotny observed, "It kind of makes you have to go deeper and infer some things." And he added, "I like books that make you think." These students and some of their classmates had questions for the author of The Art of Secrets, starting with Hunt eighth grader Pierson Nitz-Caldwell. Pierson Nitz-Caldwell: How did you come up with this idea for such a cool story and such a cool format for it? James Klise: My initial inspiration was that I wanted to write a mystery. And when you write a mystery, you always start with the point-of-view of the person who’s committed the crime. And so I came up, initially, with the crime story. I knew what the crime was. I knew how the crime would unfold. I knew who was responsible for the crime. And what I didn’t know was how this community of characters would respond to each development of the story. Saba Kahn is the main character in The Art of Secrets. She’s a first generation Pakistani-American. The story starts out when Saba’s family’s apartment is destroyed by fire. The police say it’s arson, and it might be a hate crime. 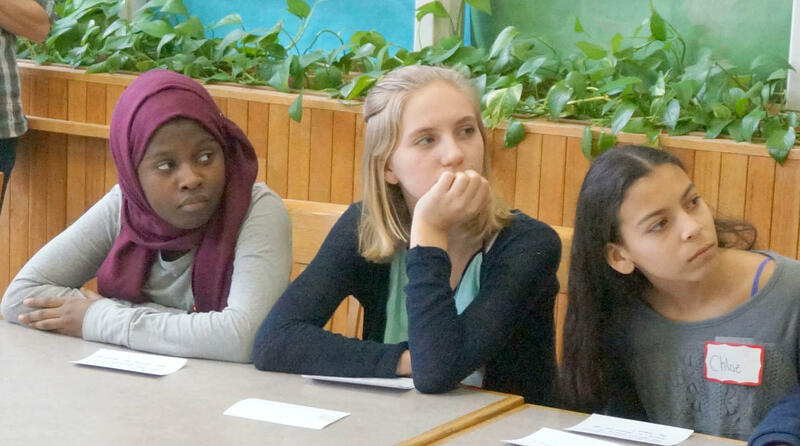 Najma Malawia, Mollie Allen and Chloe De Bedout all had questions for author James Klise. Najma Malawia: Why did you choose Saba’s family to be from Pakistan? James Klise: I live on the north side of Chicago, which is a remarkably diverse place, racially, ethnically. And one of my goals as a writer is to make sure my books reflect the diversity of the place that I live. And in this case, I began the book in the fall of 2008. And that was a time when Muslim Americans were experiencing a lot of discrimination on the north side of Chicago. And I was thinking a lot about how it must be to be part of a community, but to be treated like an outsider. So when I was assembling the characters for this story, I knew that I wanted to include a Pakistani-American family to put at the center of that. Edmunds seventh grader Emma Lowry noticed the outsider experience is central to the story in The Art of Secrets, and she asks author James Kilse about that. Emma Lowry: Your book is all about outsiders. Were you ever an outsider in your life and how does that relate to your book? James Klise: Oh, absolutely I’ve been an outsider in my life. I think everybody has. Insider and outsider status is one of the great themes of young people’s literature because it’s a universal experience that sometimes you’re going to walk into a situation and feel like you’re an absolute insider. And that you are with the in-crowd, you are part of the power dynamic and you’re in control. And there are plenty of other times in your life when you feel like you’re on the outskirts and not included. And I certainly went through times in my life where I felt like I was not popular enough or powerful enough. Sometimes you’re going to feel like an insider, sometimes you’re going to feel like an outsider. And, for me, what’s most interesting is what you do with that position. Emma Lowry: The book itself is sort of different from other mysteries, and that makes it an outsider a little bit. Hunt sixth grader Miles Ellis Novotny’s favorite character in the book is a foreign exchange student named Javier. Miles Ellis Novotny: What gave you the idea for making the character Javier? James Klise: Javier is one of my favorite characters in the book. He’s from Spain. So, in telling the story I wanted there to be different degrees of insiderness and outsiderness, if that makes sense. Javier was a great character to bring in. He’s such an obvious outsider. He’s from a different culture. And I knew that, because he was an outsider, he might end up a suspect in some of the crimes that take place on campus. Many of the characters, like Javier, are students or teachers at Saba’s high school. And we hear from each of them in different ways. With so many different narrators throughout the book, Edmunds eighth grader Klara Martone wonders why we don’t hear more from the protagonist. Klara Martone: Since Saba was the main character, why did you have her only write in journal entries a couple times throughout the whole book instead of having her be the whole narrator since the story was about her life? James Klise: I wanted to make sure there was at least one narrator in the book that the reader could trust was telling the truth. Because Saba is writing in her journal, and a personal journal is not generally shared with other people, we knew that she would be honest in her account of her feelings, and her motives, and her observations as the story progresses. 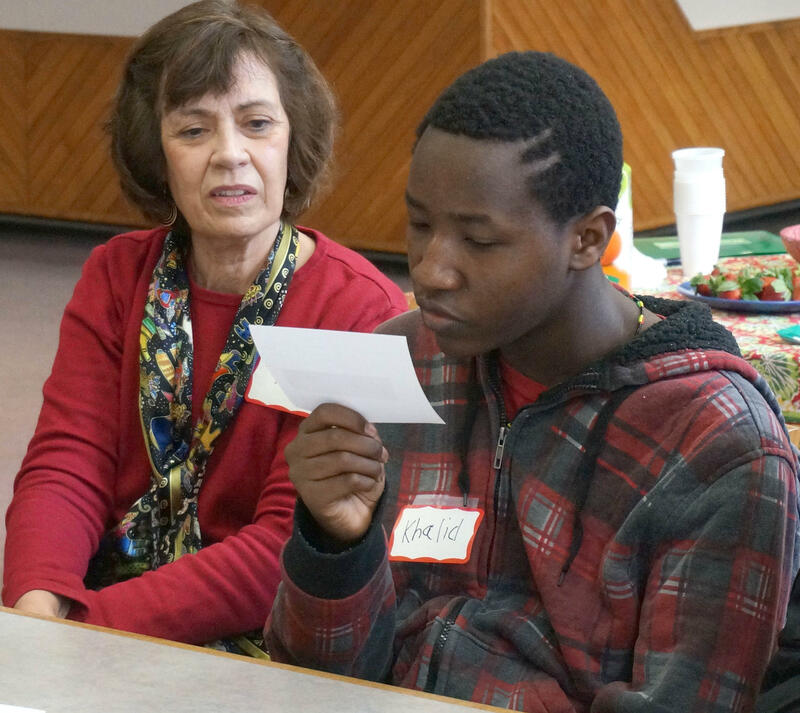 Edmunds Middle School Librarian Carole Renca looks on as eighth grader Khalid Barwani reads a question about the book. Edmunds seventh grader Adip Grung was one of the students who found the book’s unusual format tough to follow. Adip Grung: Why did you make it so complicated? James Klise: Adip, I appreciate that question. And one of my goals when I began writing The Art of Secrets was to tell a mystery that the reader had to solve by the end. All the clues are there for the reader to know who committed these crimes and at the end of the book, Saba’s own conclusions are correct. But it doesn’t spell it out for you. There’s no long, signed confession. But the clues are there so that the reader understands what’s happened and why it’s happened. Edmunds seventh grader Mollie Allen wondered how much of Klise’s own life is reflected in the story. Mollie Allen: How is the book connected to your life? James Klise: When I began The Art of Secrets my goal was to tell a fun, sort of twisty mystery. And one of the interesting things about writing is that your intentions will change as you work on a project. And so even when I began the story it didn’t seem to connect with my life, the more time I spent with those characters, and explored their motives and their feelings and their experiences, the more of my own self went into the book. The times in my life when I felt like an outsider. The times in my life when I felt like a newcomer and had to make a special effort to sort of connect with my new community. I can look at each character in that book and find some aspect of myself. The Art of Secrets is a “twisty mystery” that keeps the reader guessing right up to the very end – which prompted a question from Hunt eighth grader Chloe De Bedout. Chloe De Bedout: I would like to know what your inspiration for the twist at the end was. James Klise: Chloe, you’re right, there is a twist at the end of this book, and I did know about that twist before I ever began the book. It was all part of the master plan of this crime. What was really fun to me was to see how the other characters would piece it together and how the reader would piece it together. Chloe says she had fun figuring out how the mystery ends. Chloe De Bedout: It was a surprise. I mean, I had my suspicions like everybody else. But at the end, when I finally connected the last dot, I had to take a second and be like 'whoa' and think about everything that they had to piece together to pull this off. And it was really cool and inspiring. Students from Edmunds and Hunt Middle Schools had a good time getting together for their first joint book discussion. While figuring out the mystery was a challenge for some of these Burlington Middle Schoolers, they all said they had fun trying! Dorothy's List is sponsored by the VPR Journalism Fund.